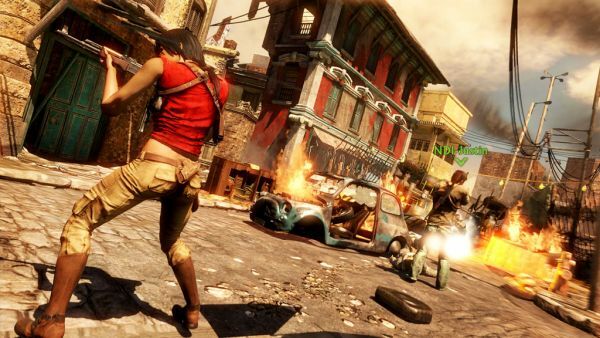 Co-Optimus - News - Uncharted 2 Beta Impressions and 100 Beta Key Giveaway! The Uncharted 2: Among Thieves multiplayer beta has been underway for a few weeks now, and the Co-Opticrew has been deep in the trenches with Nathan Drake. The beta consists of team deathmatch, a treasure capture mode and co-op! I'm sure you're like, "but Nick...I want to play co-op tooo!" Well my friends, you are in luck. We're giving away 100 codes for access to this exclusive beta test! But first, lets talk about the co-op mode. There's only one co-op map in the beta, and really it's only part of a map. 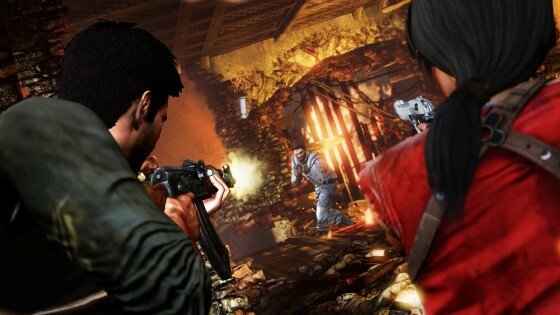 You'll play as Sully, Nathan or Chloe as you move through the war torn streets in an effort to collect treasure. The game feels a bit more like Gears of War now, with the action and shooting feeling silky smooth. Gone is that floaty feeling the first game had. As players work together taking down enemies in rapid succession they'll earn a combo multiplier. This gets applied to your cash for the map, obviously with a higher multiplier comes more cash. Cash is used to level up your rank through all the game's multiplayer modes - unlocking new perks and traits. Some of the perks include bigger clips, better accuracy, and more ammo. There's plenty of realistic weapons to obtain, my personal favorite being the M16. The levels at first felt very narrow, but a soon realized there was an element of verticality to them. Once I knew this, it was second nature to climb up and cover my team from above. Eventually you'll come to areas where an icon of a certain number of people are present. To proceed or trigger the event you'll need the required number of people. It's a bit of an artificial wall, but it does force players to stick together to some degree. Unfortunately the beta ends just as you really get into it. All in all - I wanted more. It may not be a total in depth co-op campaign, but it's compelling enough to make me want to play it. And even though I beat the 15 minute taste a dozen or so times now, I still want to go back for more. To win one of our 100 beta codes...well just leave a comment. We'll be sending out codes randomly over the next few days to winners at a rate of 20 a day. I think we should have enough to accommodate everyone....maybe. Update: We've just been informed these keys require a North American PSN account to redeem. Sorry for any inconvenience. Update 2: The rest of the keys are now hidden within the site. Hint - it's "Uncharted 2 related."